What Are the Signs and Symptoms of ADHD? With the right support, given from an early age, there are few limits to what those who live with this condition can achieve. Olympic athletes, Michelin-starred chefs, entrepreneurs, doctors, artists and many other outstanding professions all boast individuals with ADHD among their elite. 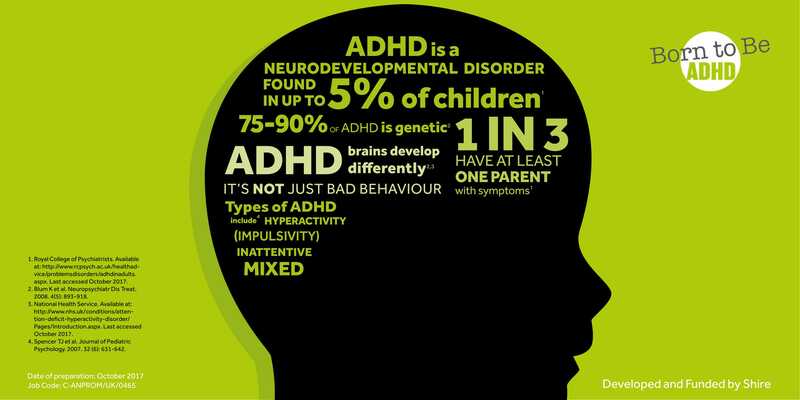 Although ADHD is an internationally-recognised disease, it is still frequently positioned as a ‘non-medical’ behavioural or societal issue and incorrectly blamed on lifestyle, environment or parenting choices and is often trivialised to describe common bad behaviour. The ‘A Lifetime Lost, or a Lifetime Saved’ report, which outlines the results of a national survey of 104 people affected by ADHD, noted that people with ADHD are still facing stigma. This stigma is present across sectors, with 22% of people experiencing doubt from their GPs about whether ADHD is a real condition, while 38% of parents were criticised by school teaching staff who blamed the condition on parenting skills. The report can be downloaded here. 1 Royal College of Psychiatrists. Attention Deficit Hyperactivity Disorder in Adults. Available at: http://www.rcpsych.ac.uk/healthadvice/problemsdisorders/adhdinadults.aspx. Last accessed June 2018. 2 Department of Education. Number of schools, teachers and students in England. Available at: https://www.gov.uk/government/publications/number-of-schools-teachers-and-students-in-england/number-of-schools-teachers-and-students-in-england. Last accessed June 2018. 3 NICE Clinical Guideline. Attention deficit hyperactivity disorder: diagnosis and management. Available at: https://www.nice.org.uk/guidance/ng87. Last accessed June 2018. 4 White HA and Shah P. Uninhibited imaginations: Creativity in adults with attention deficit/hyperactivity disorder. Personality and Individual Differences 2006; 40: 1121-1131. 5 Kooij SJ et al. European consensus statement on diagnosis and treatment of adult ADHD: The European Network Adult ADHD. BMC Psychiatry 2010; 10: 67. 6 Scottish Intercollegiate Guidelines Network. Management of attention deficit and hyperkinetic disorders in children and young people: A national clinical guidelines. Available at: http://www.sign.ac.uk/assets/sign112.pdf. Last accessed June 2018. 7 Pitts M, Mangle L, Asherson P. Impairments, Diagnosis and Treatments Associated with Attention-Deficit/Hyperactivity Disorder (ADHD) in UK Adults: Results from the Lifetime Impairment Survey. Archives of Psychiatric Nursing 2015; 29: 56–63. 8 National Health Service. Available at: https://www.nhs.uk/conditions/attention-deficit-hyperactivity-disorder-adhd/. Last accessed June 2018. Job code: C-ANPROM/UK//1743 Date of preparation: October 2018. This information is available to the public for information purposes only; it should not be used for diagnosing or treating a health problem or disease. It is not intended to substitute for consultation with a healthcare provider. Please consult your healthcare provider for further advice. You are now leaving Born to Be ADHD.